Why does it say I'm deactivated? Why doesn't Login remember my user name? I got a *new* password, but still can't Login!!! ... then please send email to the Datsun1200.com web site Administrator (click for email address). Do you have an account? If not, create one here: Register Now!. Test your account from a different computer or phone. If you can login on one machine, but not another, the problem is with that machine. Symantec Internet Security. I couldn't login for the past week. Disable the program to see if you can login. If you can...well talk to the manufacturer about how to configure it appropriately, or just leave it disabled. Also, since Datsun1200.com is based on XOOPS, see this XOOPS FAQ page: Why am I having problems logging in and posting when my firewall is on?. Scroll down a bit to see what people are suggesting about how to 'disable' these programs. NOTE: The Windows XP built-in firewall is not known to cause problems. I use it myself and it's never locked me out of Datsun1200.com. However if someone changes the settings of the firewall, it is possible to lock out the site. This option is found in Edit Profile. After signing in, click Edit Account on the left side of this page. This option is near the bottom of the Edit Profile page. 2. The top Login box doesn't remember! So you use the Login box on the right side of every Datsun1200.com page. The site would not allow me to log in even when I applied for a new password and used it to log in!!!!!!! Here is the solution that helped many people: Set your PC/device time zone. See Check the Time and Date of your PC. Note that there are probably other causes, so don't get discouraged if that's not it. Send email to me with details and I'll give some advice, hopefully we can solve the problem. So check this first! Certain programs check validity of settings against time (e.g. the password is only good for one year, login good for one hour, etc). The DST setting is one of the causes for a one-hour problem. 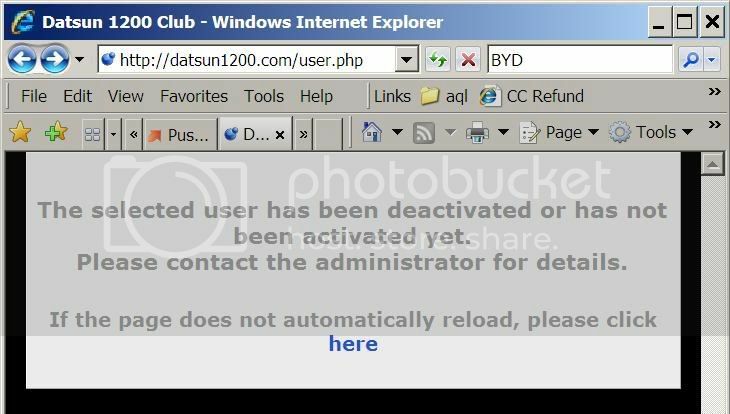 Unless you are getting the message about being banned or something like that, the problem is not with Datsun1200.com, it is with your PC or device. If you see other current posts on the site, you can tell that others are able to log in so it is not a general site problem. If you have different Web browsers such as Chrome and Internet Explore, try using the other one. It may be a configuration problem with only one browser. It resets *everything* about your web browser including home page and obscure settings that may be misconfigured. If none of these suggestions solve the problem, send email to me with details (especially the exact messages you see) and I'll give some advice, hopefully we can solve the problem.